Boasting some of the Caribbean's most stunning mountain scenery, St Lucia is ideal for both rejuvenation and adventure. Covered in miles of unspoiled rainforest, the small island of St Lucia, with its hidden waterfalls, breathtaking views, friendly locals and authentic culture, won't fail to impress even the most travelled individuals. Amidst banana, mango and avocado plantations, between architecture hinting at a French colonial past, St. Lucia reveals itself as a truly exotic and colourful destination, with a welcome which far exceeds its size. Adventure seekers can surf and sail in the pristine waters, or even join a marine safari, perhaps being lucky enough to spot a whale or playful dolphin along the way. Those that wish to relax with a good book and a cocktail can flop and do just that. The famous Piton Mountains are an essential stop, as are the drive-in volcano and botanical gardens. On an optional excursion, perhaps delve into history on a heritage tour, visit a rum distillery or head into the rainforest on a nature trek. Rodney Bay has some of the best shopping, bars and restaurants on the island. Although the St. Lucian nightlife pace is very relaxed, Rodney Bay has a wide choice of bars with live music. About a mile north of Rodney Bay is Gros Islet village, where the much loved Friday night “jump up” takes place. Rodney Bay is also a mecca for yachting, plus it is here that the island's longest stretch of white sand, Reduit Beach, can be found where we are fortunate enough to be within walking distance. Take in the weekly Ansa La Raye Fish Festival! This modern, warm and laid back hotel is located just a short walk from the fabulous entertainment centre of the island, Rodney Village with its great selection of restaurants, bars and range of shops. Fabulous Reduit Beach is a 5 minute walk away with its wide range of water sports and beach chairs (payable locally). Swathed in lush gardens, facilities at the hotel include a large swimming pool, 2 restaurants (Caribbean Bistro & Bar and Creole Grill), Pool Bar and Beauty Clinic (additional charges apply). There is live music most nights by the pool. We are based in the Coco Kreole block of the hotel which is a slightly older block and closer to Rodney Bay Village. Our rooms are fully equipped with air-conditioning, ceiling fan, fridge, safe, iron, tea/coffee-making facilities, radio, cable TV, hairdryer, complimentary WiFi. Some rooms come with a small balcony. The transfer from the airport to the hotel is approximately 1 hour and 25 minutes. Start your day with a visit to the renowned St Lucia’s Castries Market, which was recently ranked the Third “Best Food Market” in the World by The National Geographic Magazine. Opened in 1894, this market in St. Lucia’s capital is still the island’s cultural soul and the best spot to buy island spices and craft items. Proceed onto historic Morne Fortune, featuring panoramic views of the capital city, before travelling through banana plantations and arriving at the award-winning distillery “St.Lucia Distillers”. Meet the renowned “Rum Ambassador”, tour the distillery and gain insight into the distilling process. Enjoy a free tasting of a wide number of exotic blends of rums and liqueurs. Purchase any brand at excellent prices. See Marigot Bay. Admire the island’s exotic beauty as you glide over tree tops in the comfort of an open-air gondola. Discover a whole new world from high above as you look down onto and glide through blooming tropical flowers and abundant flourishing vegetation. Your expert guide recounts amazing anecdotes and amusing tales. Look out for colorful birds, flora & fauna. A fascinating day out at sea cruising the island’s pristine waters along the dramatic & scenic western coastline. Disembark at the magical town of Soufriere to visit the sulphur springs in the drive in volcano & the award winning Diamond Botanical Gardens. 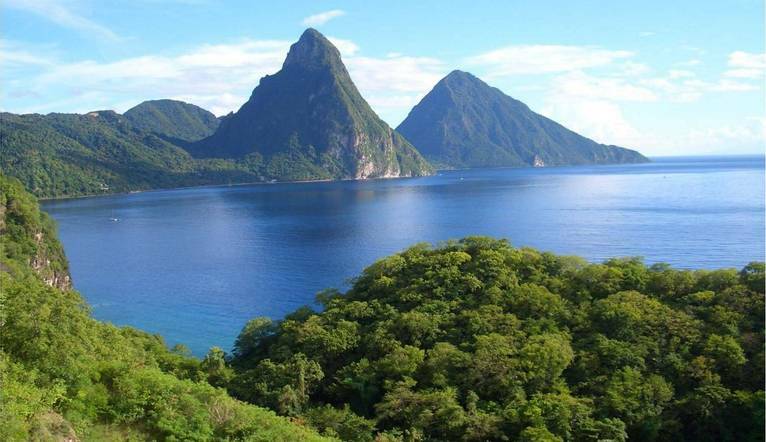 See the renowned & stunning “Pitons”. Enjoy lunch, swimming and a cruise through Marigot Bay, one of the most beautiful bays in the Caribbean. The temperature tends to be very hot in the summer months, so we recommend bringing casual, cotton and lightweight clothing to wear during the day. Early and late season evenings can be cooler so a cardigan or light jacket and even some rainwear is necessary – particularly in May and June when you may experience some spring thunderstorms. After 18:30, men should wear trousers and collared shirts with short or long sleeves (no T-shirts or tank tops)in the restaurant.